Israeli PM Benjamin Netanyahu thanked his Bulgarian, Turkish and Russian counterparts, as well as other world leaders who sent help to quench the deadly blaze near Haifa. In particular Netanyahu spoke over the phone with Turkish PM Recep Tayyip Erdogan and thanked him for sending firefighting planes in spite of severely strained relations between the two countries. Netanyahu also made a special effort to meet Turkish pilots to thank them personally, informs Israeli site ynetnews.com. Erdogan on his part has expressed deep condolences for the loss of life in Israel. Netanyahu said that he was grateful to Russian PM Vladimir Putin, who sent "a very large Russian plane, perhaps the largest of its kind in the world." Bulgarian PM Borisov, on his part, had ordered a team of 90 firefighters to move to Israel. Initially Bulgaria was the only country who sent firefighters, while others have helped with equipment such as planes. 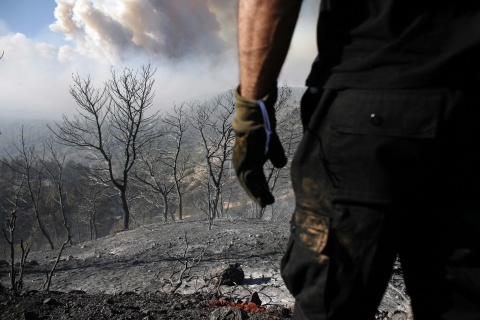 British, Greek and Cypriot teams have joined the firefighting forces Friday noon. The raging fires near Haifa that started in a dumping ground and went out of control Thursday evening have claimed the lives of 41 and caused the forceful evacuation of at least 15,000 persons. In addition, the blaze has destroyed the kibbutz of Beit Oren and caused severe damages beyond it. At present, the fire has subsided, but large amounts of smoke continue to swell in the area. Apart from Bulgaria, Turkey and Russia, aid has come from Egypt, Azerbaijan, Spain, Croatia, France and Jordan.